Doing a competitive analysis can be an essential step in starting a business. For example, you’d be wise to do a competitive analysis before adding a second location, expanding into new territory, or adding a new product line or division. Here’s how to better understand your competition. 1. Identify competitors to your business. These could include the obvious (the restaurant down the street from yours) and the not-so-obvious (the grocery store that also sells ready-to-eat sandwiches and salads is also competing for consumers’ dining-out dollars). To avoid being overwhelmed by a list of dozens of competitors, consider narrowing your list down by selecting the three to five companies that are your toughest competition. 3. Decide what information to gather. Product or Service: What do they sell? What are the features of their products or services? What are the benefits to the customer of their products or services? How is it priced? What are the costs to produce the products or provide the services? Marketing: What is the company’s target market? What marketing and advertising strategies do they use? How often do they advertise? What image does their brand convey? Sales: What sales channels are used to distribute the products or sell the services? Reputation: What is the company’s reputation with customers and prospects? How well do customers rate them on service, price, quality and other factors? What do customers like and dislike about the company? What type of publicity does the company get? Finances: What are their annual sales? Do they have outside funding—if so, how much and from whom? How profitable is the company? Growth: What geographic area does the company operate in? Is it expanding (new products/services, new geographic area, new markets) or contracting? How many employees does it have? What is its growth rate? How much market share does it have? Public documents: SEC filings, business formation records, patent applications and other publicly available records can provide some information, especially if a company is public. The competition’s website: Check it regularly to see how they’re promoting themselves and what they’re planning. You may also be able to find product spec sheets, press releases, user communities or sales materials here. Publicity: Look for articles, blogs or press releases about the company online or in print. Industry publications or local newspapers are good sources for these. Or create a Google Alert for them so you can keep current on what they’re doing or what others are saying about them. Advertising campaigns: A company’s advertising can tell you a lot about its brand, positioning, target market and plans, as well as its marketing budget. Marketing materials: Sales brochures and literature from the business are a great source of information. Download any e-books or white papers your competitors offer. Salespeople: Your inside or outside salespeople can be great sources of competitive information. Salespeople may get an earful about why prospects don’t like the competitor’s products or services—or why they do. Remind salespeople to soak up any competitive intelligence they can and report to you. They may even be able to get copies of the competition’s sales sheets or other literature from prospects. Business contacts: You can learn a lot just by talking to your business contacts. Your vendors, suppliers and colleagues at conferences, networking events or trade shows will often share useful information about the competition during casual conversations. Social media: Don’t be blatant about it, but you might use social media to keep up on what the competition is doing, who they’re courting and what they’re talking about. Your employees: Employees often come in contact with competitors’ employees or hear news through the grapevine. Consider asking them to share with you anything they learn about your key competitors. The competition: You might visit your competitors’ locations to take note of things such as customer service, branding, quality and customer base. 5. Create a document for your information. Depending on the number of competitors, factors and amount of information you’ve collected, you might do a simple Word chart or a more detailed Excel spreadsheet so you can see your information at a glance. 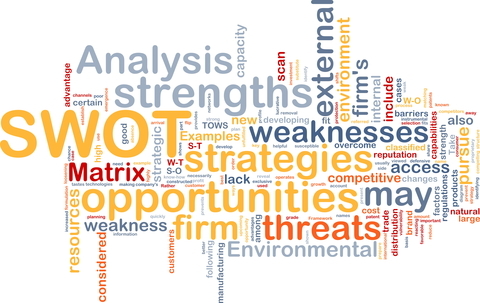 Once your competitive analysis is done, you might perform a SWOT analysis of your competitors’ businesses, as well as update your own. With this analysis, you may spot opportunities for your business as well as threats to its future. Once you have your competitive analysis in hand, you may be able to pinpoint your business’s competitive edge and make sure your marketing, advertising and branding all emphasize it. Remember, a competitive analysis isn’t a one-time thing. Now that you know your key competitors inside and out, it’s good practice to keep an eye on them and particularly note any changes, such as an increase or decrease in advertising, hiring or laying off employees, expanding or closing locations. Changes like these indicate new plans that, with your competitive analysis in hand, you may be able to counteract with your own strategy.